It's almost that time of year..... sorority recruitment. That means singing songs, wearing matching outfits, and talking about yourself are back in style. Well, only in college. Sorority recruitment, rush, whatever you wish to call it is when women go through the recruitment process to join a sorority. At Iowa State recruitment in the fall is known as Primary Recruitment. But, every school calls it something different, and treats the process differently. As a sorority alum, I'm going to give you my tips and tricks on how to survive sorority recruitment. *NOTE: EVERY school is different and treats the recruitment process different. These are my tips and tricks based on my experience alone. Everyone's experience is different and I believe there is a chapter out there for everyone! So, take this with a grain of salt and try and put it into persepctive for your specific school and Greek system. Be yourself | Don't be anyone BUT yourself! If you aren't yourself I guarantee you WILL end up in the wrong chapter. Acting like something your not just to get into the "cool" or "popular" house is a big no no. Number one, appearances can be deceiving. Just because it may seem like the cool sorority to be in, doesn't mean it's right for you. Number two, you want to end up in a chapter with girls like you! If you act like someone or something your not you will end up in a chapter like whoever you're acting like. So, do yourself a favor and just be yourself! The right chapter will accept you even if you are a major goofball (I am a major goofball and found a chapter that accepted me so no worries, goofballs unite). You don't have to agree with your friends | Luckily when I went through recruitment I only had two good friends who were going through the process as well. But, if your going to the same school with all of your BFFs and you listen to all of the chapters they like it can be overwhelming. My philosophy, that worked out well, was to keep my opinions to myself and to just go with my gut. If you start picking chapters your friends like, just because they like them, you may end up not finding the best chapter for you. Be selfish and think about yourself! Think about what chapters you liked during each round and make your selections based on your opinions, not on what your friends are picking. Trust me, even if you and your friends end up in different chapters you can all still be friends. It's actually really fun to have friends in different chapters! So don't sweat it if you don't 100% agree with your friends and like all the same chapters. Act natural | This goes along with being yourself, but act like you would act on any other day. Just because it is recruitment you shouldn't act or talk any differently! Don't be nervous! | This leads me to.... don't be nervous! Trust me the girls on the other side are just as nervous if not MORE nervous then you! They are worried about keeping the conversation going, asking good questions, and getting to know you. So, no worries, keep calm and carry on because recruitment should be fun on nerve racking. WHAT TO WEAR: Every school has different outfit requirements for each day. But, my overarching advice is to wear what you normally wear. If you want to buy new outfits for recruitment, go for it! I certainly did (no shame). However, don't feel like you need to go buy all new preppy clothes or clothes you've seen girls from your high school wear to sorority parties just to join a sorority. Every girl in every sorority has their own personal style that is unique to them. I wear Lilly Pulitzer all the time, but not every girl in my house did. So, don't stress to much about your outfits! Wear what makes you comfortable! Because if you aren't comfortable in what your wearing, it's gonna be hard to focus on anything else. If you're looking for specific outfit ideas or you have questions please feel free to leave them in the comments below! 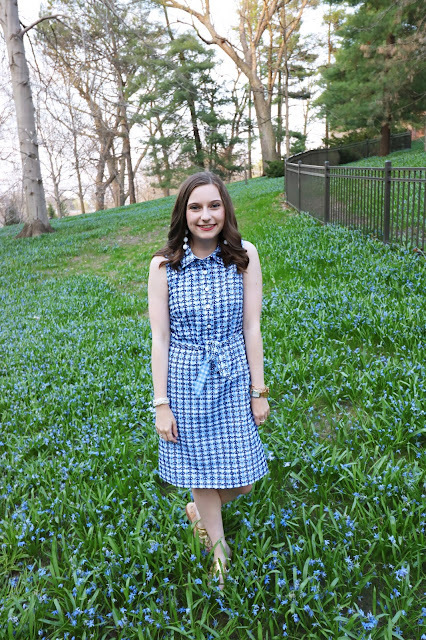 I also have a post from bag in the day on what I wore to recruitment and my outfit ideas from back then! What are your tips and tricks for sorority recruitment? Leave them in the comments!